Building a Movement Against War, Injustice & Repression! 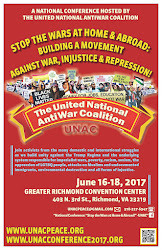 Click here to read the 2017 UNAC Conference Report. Audiovisual and livestreaming services provided by Wilton Vought of Other Voices Other Choices. Contact Wilton to inquire about coverage of your peace & justice event. .
Click the menu icon in the upper left hand corner of the video to see the entire list of videos from this conference or visit the Program Schedule page to review plenary participants and topics. Thank you for joining 300+ activists in the struggle to "Stop the Wars at Home & Abroad!" through shared knowledge and a unified front. People who attended were from the many domestic and international struggles that must unify against the Trump Regime and the underlying system responsible for imperialist wars, poverty, racism, sexism, the oppression of LGBTQ people, attacks on Muslims and undocumented immigrants, environmental destruction and all forms of injustice. Read the Conference Call To Action here. is a national coalition of organizations that fight against wars at home and abroad. United National Antiwar Coalition, 2/2017. UNACpeace.org. Travel theme. Theme images by mammuth. Powered by Blogger.